Jackson Browne's musical prowess has been recognized around the world since the 1960's. In 2004, he was included in the Rock and Roll Hall of Fame. His career spans five long decades yet his voice still remains to be one of the best. He is an amazing songwriter which made him come up with chart topping hits. Jackson Browne has written and performed the most moving and literate songs in music. He has encouraged a unique genre of songwriting which invoked honesty, real emotions and political issues. In 2007, he was inducted in the Songwriter's Hall of Fame. Jackson Browne will be having a concert in Las Vegas, NV on August 20, Saturday. The concert event will be held at the Pearl Concert Theater, Palms Casino Resort at 8PM. His natural sense of melody and deeply reflective lyrics has made him the most iconic artist in the 1970's. He collaborated with John David Souther and members of the Eagles. He was the first to establish a mellow sound genre which is purely based on wishful philosophies and romance. Jackson Browne in Vegas is a one night event that you shouldn't dare miss. It's going to be a night filled with nostalgia, good music and lots of fun. Catch his live performance on August 20th and get to enjoy his amazing music. He was born in Heidelberg, West Germany. His parents decided to move to Los Angeles when he was three. When he became a teenager, Jackson Browne began having a fascination and interest for folk music. He started venturing into songwriting and playing the guitar. He sang his compositions in local folk clubs around his neighborhood. His career first started in the 1960's where he played at different venues in Orange County and Los Angeles. He grew up and Southern California and has lived there all his life, except for a short period in New York. It was in 1972 when he first released his debut album under Asylum Records which was owned by David Geffen. Ever since, his career continued to become successful. Over the years, he has released a total of fourteen studio albums. He also has four collections of live concert performances. Jackson Browne's latest studio album is called Standing in the Breach. It includes ten singles which are all inspired by politics and his personal experiences. Most of the songs talk about hope, love and thriving amidst life's difficult challenges. Jackson Browne is an avid advocate of institutions which support human rights, education, arts and the environment. Since he is very passionate about his advocacies, he co-founded the Nukeefree.org and the Musicians United for Safe Energy. He was one of the group's leaders together with John Hall and Bonnie Raitt in 1979. He was a very active member of the Alliance for Survival and the Abalone Alliance. Jackson Browne strongly campaigns for going against the unnecessary usage of plastic bottles filled with water. On his tours, he insists not to use plastic water bottles to help the environment. Because of his incredible efforts against environmental abuse, he was awarded the "Environmentalist of the Year" by the Surf Industry Manufacturers Association in 2008. Jackson Browne in Vegas will surely leave audiences captivated by his soulful voice and musical prowess. In 2002, Jackson Browne was awarded the John Steinback Award. It's only given to artists who have had a large contribution fighting for environmental causes and social values. He has also received the LEAF Award, Lifetime Environmental Achievement in the Fine Arts, from Duke University. Additionally, he was awarded the NARM Harry Chapin Humanitarian Award and the Chapin World Hunger Year. Occidental College located in Los Angeles has also given him an honorary Doctorate of Music award. The college stated that he had a remarkable musical career which has been successfully combined with personal artistry and a clear vision of social justice. Jackson Browne is the quintessential California born singer songwriter. Although James Taylor and Joni Mitchell's career ranked close to Browne's, he still remained to be the most successful. His first album mostly talked about his personal experiences. However, it also served as the touchstone for an entire generation to embrace their journey to adulthood. Jackson Browne loved using lyrics which were literate and introspective. His laid back personality and superb songwriting skills made people become interested in him. His first four albums has helped him build a loyal following which helped him dive into the mainstream. The height of his musical career was during the 1970's to 1980's. It was during this time when all of his four albums reached the Top Ten charts. During the mid-80's he got involved in serious political protests which made him less active in songwriting. However, he had a successful comeback in 1993 with the album called I'm Alive. 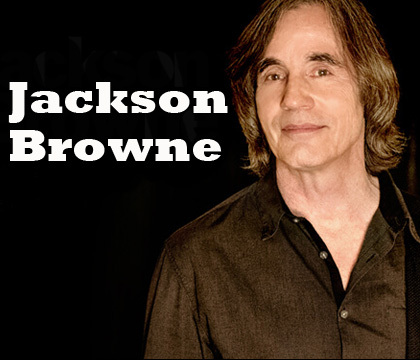 Jackson Browne in Vegas will surely be a memorable event as he performs his classic hits. Most of the songs included in the album I'm Alive are all written from his personal experiences. It was the album that made him the topic of headlines in mainstream music. During the spring of 1996, Jackson Browne released a new album called Looking East. Six years afterwards, in 2002 he released The Naked Ride Home. In 2004, The Very Best of Jackson Browne was released to the public in a two part disc. It was the same year when he was inducted by Bruce Springsteen to the Rock and Roll Hall of Fame. He went on a world tour and played shows across the globe in an intimate setting. In 2005, Jackson Browne released the Solo Acoustic Volume 1 which was a compilation of all the concerts he had the previous year. It was released by Inside Recordings which is an independent label he founded. In 2008, Solo Acoustic Volume 2 was released. Later that year, he released a brand new album called Time the Conqueror. In 2010, he released Love is Strange and the year after that he released Live in Milan. His newest studio material was issued in October 2014 by his own label, Inside Recordings. It was his first studio album release in the past six years.